I wasn’t sure if would attend today’s Sweat Your Prayers class or if I would practice yoga closer to home instead. When I learned that the class would be held at Martha Graham studio in the West Village, rather than at its usual home at the Joffrey, and that 5Rhythms teacher Ray Diaz would be leading, I decided to make the trek. At the last Sunday Sweat Your Prayers class that Ray taught, I was thoroughly transported, windswept to different dimensions, and I was eager to see where class might lead me today. Parking on Bethune Street right in front of the Westbeth Arts Building, where the Martha Graham studio is located, I briefly considered bringing in the laundry detergent that I would need later in the day, wondering if the strident cold might cause the detergent to freeze as it had the last time I attempted to use it. There was a short delay with letting people enter the 11th floor dance studio, and it had the effect of pooling water behind a damn before a high water release. One friend embraced me, picking me up off my feet and cracking my back enthusiastically as she shook me from side to side, her own pony tail bouncing animatedly. Many ebullient conversations intersected and wove together in the foyer space while we waited for the door to open, inviting us into the studio. When the door opened, we streamed inside, lodging our bags and backpacks on the wooden bench by the west wall. I paused for a moment on the low floor before taking a breath and stepping up onto the much-beloved, forgiving, sprung dance floor. Then I moved through an energetic ritual to help me arrive, closing it with a low bow and moving into the wide room. I began to lightly drag my feet over the soft grey linoleum. The dance floor at Martha Graham is a shaped like a large square, with no columns or impediments of any kind in the middle. There are big industrial windows on the east and west sides, opening to a spacious vistas of New York City. The big room was at maximum capacity; and I found a spot on the floor to luxuriate in circles, beginning to stretch and wind up. A cherished friend who I had spent meaningful time with the previous day appeared upside down in the frame of my vision as I stretched, and as I shifted to one leg and began to right myself, she knelt down and curved herself around my back, embracing me and laughing delightedly. I rubbed her forearm and her ankle, and made a sound like a contented baby, touching my cheek to her lower leg. Before long, my attenuated circles, sometimes expressing the maximum plane of my prone body, led me to move through the room. A friend who I had greeted excitedly in the foyer with a twittering, shimmy-stepping “I’m-so-happy you’re-here-and-I-will-get-to-dance-with-you” dance crossed my path and we began to move together in Flowing. For some time I continued to engage from the floor, though he was upright, curling and rising up onto the back of my head, or up into my raised heel, curving and arcing. I have been exploring the limits of possibility with this friend for ten years now. For the first many years, we joined most often in Chaos, following each other in the most erratic and creative of patterns, then bursting into an entirely new expression, wordlessly supporting and encouraging one another to be wholehearted, free and wild. Today, for the first time ever, as I got to my feet, we joined in a soft version of Flowing, tiptoeing and placing our feet down with the utmost mindfulness as we crept in circles around each other. Before long, we began to trust that we had paid significant homage to the ground, and let ourselves lift off, in a booming and articulate Staccato, with leaping, marching, lateral gestures, and expressive elbows and upper arms. When the song shifted, he made a gesture like tipping a cup up to drink, and took his leave. Noticing how much heat I had raised with the breath, I began to move throughout the space, joining with anyone who seemed open to it, testing out many different people’s movements for myself. I joined two friends and, observing the character of their dance, began to roll forward from the shoulders, moving my upper body in an angular plane, then moved to bouncing and coiling from the knees, dipping them sideways like a skier working moguls on challenging terrain. In Chaos I let loose, occasionally slowing to Still Chaos as I passed through different pockets in the room, often ferocious, delighting in many brief partnerships. I let myself find edges, sometimes even awkward, clipped resistance; sometimes expansive and swirling. Occasionally, I would raise my rolling and released head to observe the room, breathing it in, this big energy, this surrender, this gorgeous, sweat-drenched ugliness that feeds me, that feeds the world. In Lyrical I grazed my hands on the ground, sinking low, then glided and soared, sometimes slipping between the tiniest of openings between bodies, between knees, in the triangular spaces of curved elbows, above heads. In Stillness I joined with three others, soft and porous. I saw sky and clouds beyond the ceiling, then the four of us grew large, rising to the level of the clouds. I let the bottoms of my feet go and soon we moved among the clouds. Cloud forms coalesced as castles, as dragons, as pathways, my second grade teacher, my son’s second grade teacher, an image from a film–the ever-shifting display, form and its opposite, dispersing again as mist, returning to formless space, my body boundless, extending far beyond its tiny edges, overlapping with everything. Two days before, I had been taken apart in a conversation about code switching by a person of color. He challenged me to both act to end racism, and to be sure to act with precision and sensitivity. He also challenged me to get past my own ego so I would be able to see more clearly. 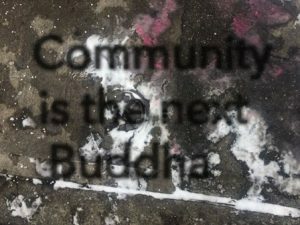 On the note of letting go of my ego constructions—even the positive and productive constructions I have created for myself—I thought about an incident that took place during a meditation retreat I was staffing several years ago. We were sitting on meditation cushions in a small group of perhaps ten people, engaged in a formal discussion. We were talking about aversion—the Buddhist concept of pushing away what is unpleasant or uncomfortable. In response to one of the comments about the aversive energetic shell humans create to keep ourselves safe, I said, “Well, you know. It would be one thing if shutting down or pushing away actually worked to make us happier or keep us safe. The thing is that it really doesn’t work. If it did I would be all for it, but it doesn’t.” I’m not exactly sure how it was framed, but I said something about, “It’s not like it’s the subway in the South Bronx at 2AM in the late 1980’s, when you might actually need a shell around you.” A flash of raw anger shot around the circle; and every single person felt it before even a word was said. One woman spoke up, expressing that she felt that what I said was racist. Man, that hurt. Shame of the most intense possible quality flooded me. My heart started beating like crazy. My partner of many years at the time was a black and latino man. We had shared hundreds of hours in discussion about racism, ranging through many different levels. Secretly, I had always been terrified that on some deep level I was actually a racist. Though I was afraid, I approached the woman during the next break and asked her to talk with me about her feelings. She was very receptive; and after, I understood how she could see my comment as racist. She also thanked me, saying that she was always calling people out for racist comments; and that I was the first person who had ever come and asked her to talk about it. This terribly painful experience gave me great insight; and a rush of relief flooded me with another set of powerful chemicals. I realized I had been afraid that there was some essential part of me that was racist. Every other *essentialist part of my psyche had been rigorously interrogated, but this part remained hidden, obscured by shame and fear. I realized that just as there is no essential self; too, there is no essential racism. As I currently understand it, racism is a process—one that affects every single person who lives in this culture. Fundamentally, it is our flawed human tendency to separate the world into “us” and “them” that lays the foundation for racism, not an intrinsic hidden evil; though there is no denying the intensity and complexity of racism as it now functions. It would be impossible to overstate the importance of this insight for my personal path. Even my firmly-held idea that I was a not-racist was limiting my perception of phenomena, and, as such, needed to be interrogated, as much as any other part of me, in the interest of uncovering the deepest truth. Since Donald Trump was elected, I have been forced to reckon with my naïve underestimation of the power of white privilege. I looked around the room as Ray spoke, and although I can’t necessarily know how people identify just by looking, it was apparent that a very small percentage of the class participants were people of color. Before last November, on some level I believed in the fundamental vision of this country, that eventually, incrementally, everything would shake out fairly. I no longer hold that view. In the past two weeks, I have heard a white male conservative pundit and a white male country music singer speak on white privilege, phenomena I found heartening, though still small steps on the national reckoning we must undertake. Ray shared that he had done a workshop with a movement teacher during which the participants had examined many documents from the Civil Rights Era. 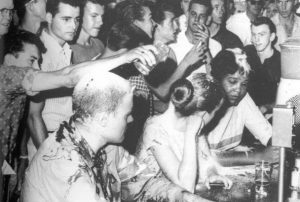 I thought of a historic photo of the lunch counter protests, of two activists seated at a lunch counter, totally surrounded by jeering white men, who were pouring food and drinks onto the heads of the protestors. These images are not symbolic. People were hurt and abused. Some went to prison. Some gave their lives. In one of the photos Ray had examined with his teacher, there was a bearded white-seeming man who Ray had taken the time to research. It turns out that the man was Rabbi Abraham Heschel, a devoted Jewish Civil Rights activist. According to Ray, at one point, the Prime Minister of Israel asked Rabbi Heschel what he was doing, given the danger he was placing himself in. “I’m praying with my feet,” was his response, and he continued to walk resolutely forward. Ray used this an example to demonstrate that racism is a human problem, not just a matter for people of color. Emotion rose through my throat, gasping upward in pockets of air. 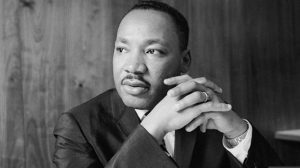 The ebullience of the first wave gave way to subtle reverence, as Ray put on one of Dr. King’s famous speeches mixed with a dance track. Erratic gasps arose now and I made no effort to hide my tears. One woman who danced deep in her hips looked into my eyes, and it was not easy to return her gaze, as I felt raw and vulnerable. I continued to move through the room, but felt more private, energetically overlapping but psychologically contained, coping with the grief, fear, profound sadness, anxiety and anger that coursed up through me from the ground, a boiling geyser. Ray also played a song with lyrics about how the measure of a country is how its women and girls are treated, then a closing song with a plaintive call to action. 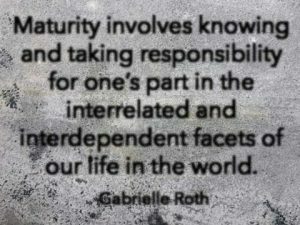 Gabrielle Roth, the mother of 5Rhythms, believed that movement could heal us both individually and collectively. I think she would have approved of Rabbi Heschel’s explanation to the Israeli Prime Minister, “I’m praying with my feet.” As we enter this new year, there can be no question about the need for all of us to step up for justice and fairness, beginning first with what’s inside, but not stopping there. Let us all take a lesson from Ray and from Rabbi Heschel. Let us all pray with our feet! *As you probably know, from the perspective of some Buddhist philosophy “essentialism” is the belief that there is a separate and definable “self” and too, implies that reality has some logical kind of coherence or definability. I threw up in the car on the way to class while crossing the Manhattan Bridge from Brooklyn into Manhattan for Tammy Burstein’s Friday Night Waves 5Rhythms class last week. I think the extreme cold tightened all of my muscles, including the muscles of my stomach. Despite this, I arrived with time to spare. Huddling with a small group of heavily bundled dancers, I waited for the elevator at the Joffrey in the West Village, all of us blowing into our cupped hands, hunching our shoulders, and discussing the weather. Stepping through the door into the spacious dance studio, I was annoyed to discover someone blocking my way into the room, apparently a member of the crew there to greet participants as they entered. I tried to step past him discreetly, but he moved toward me. I waved him away, moved to the side, and spent several extra moments allowing myself to arrive. The greeter approached me again, leaning toward me to speak, and I surmised that he probably wanted me to place my bag in the large mountain of bags and coats. Again, I waved him away, intending to place my things in the appropriate pile momentarily. I don’t like to be greeted on entering, in general. Stepping in to a 5Rhythms room is a big deal for me. I undergo an energetic ritual to help me to leave the baggage of a sometimes-very-stressful-life at the other side of the threshold. I don’t want to have to encounter another person’s gaze at this moment, as my intention is to sidestep my own ego and enter naked, unadorned. I love to connect with people, but at this crucial moment having to respond, to project, to make a boundary, or in any way to consider someone else’s experience of me diminishes my ability to let go into my own depths. After adding my bag to the high pile of coats, I fell easily into motion, sometimes on the floor, sometimes on my feet. I noticed that I was slightly edgy, tightening when a dancer near me seemed to totally ignore my existence and sprawl into “my” space. I reflected that although the holidays were filled with joy and blessings, they also held a fair share of afflictive emotion, including a painful dose of self-hatred, a fact that I kept trying to talk myself out of. My Aunt Mae, who will turn 98 this year, hosted her annual Christmas Eve party, which has been going on at the same site, in pretty much exactly the same form for nearly 80 years. The big, brick house boarded teachers before my great-grandparents purchased it, and much of the décor remains consistent, including an exquisite red pincushion with assorted pins and thread sitting on a wooden bureau, images of the Sacred Heart and the Blessed Mother, crucifixes, painted religious statues, a coarse embroidery of the three wise men en route, pictures of my grandfather and his brothers on a tractor in the fields, a still-functional cuckoo clock from one of my great aunt’s ski trips to Switzerland, and a hand-colored photo of my great great grandparents. It was still the first wave of class when the mishaps started. The first event was a falling glass vase, shaken off a little table by the bounding floor boards as the room moved into the rhythm of Chaos. I was halfway across the room, and, like many, paused to see what had happened. Four or five people who were in close proximity moved to clear the shattered glass, and the dancing continued. “Yes, but regardless of what a test says, anything could happen at any time, Meghan. You never know,” my spiritually advanced atheist father once told me, as I explained about developments in genetic testing for pregnancy. This insight raced through my mind a few days after Christmas. My parents had taken my seven-year-old son, Simon, to a movie, while I met up with some friends from childhood. Coming home, there was a police roadblock. “Which way should I go?” I asked the officer, “I just need to get to Church Street, where my parents live.” “There’s a big accident on Church Street. You can’t go that way. You have to go around,” he said, indicating a detour. I pulled over to call my parents. This was just about the time they should be arriving. It was arctic cold. And Church Street is a small side street in a nearly rural town. There would be very few cars. What if it was them? “Don’t freak out,” I told myself. I called my mom’s phone. No answer. My Dad’s phone. No answer. The home phone. No answer. I started on the detour, a seven-mile loop, calling them again and again, still no answer. And by then I was starting to freak out. And starting to picture a gory accident. My son. My parents. Please Gods, let them be OK, I pleaded. I was driving too fast, but held myself back from maximum. Finally, I arrived at the intersection of Church and Main Streets, where a fire truck blocked the road in both directions. “Please, please let them be ok,” I prayed again and again, “And if it isn’t them, please let whoever it is be ok. Let them be ok.” I parked and ran to the site, my overactive mind full of horrific images. The crushed cars were not theirs. I relaxed a little. I squeezed past the fire truck, parked at my parents, then ran back to the accident, sucking in huge breathfuls of frigid air. “Were there only two cars?” I asked a fire fighter. “Yes, just two.” It took me another hour to calm down and begin to release my muscles. I also kept thinking about how for someone somewhere this accident, when one of their family members was hurt, wasn’t just a projected nightmare, but was reality. I watched as a Life Star helicopter landed in a nearby field, praying silently. The next mishap at Tammy’s class was more serious than the previous. A fellow dancer and friend slipped backward and hit her head on the corner of the heavy folding table where Tammy stages the music. There was a very loud clonking sound. Tammy had just instructed us to partner, but everyone paused in horror, realizing what had happened, forgetting about our partners. Seeing that the fallen dancer was in good hands, I realized that to rush over would not help the situation, would help only me, so I held back, my forehead constrained and furrowed. I caught my partner’s eye, trying to let go of constraint. We made an effort to move in tandem for a few moments. Tammy shifted the group into a Tribal exercise, gathering everyone to one side of the room. She asked one experienced dancer to step forward and create a clear, simple gesture that everyone could follow. This had the effect of keeping us moving, and of taking the focus off of the dancer who had been injured, who was still sitting on the floor, holding her head. Though I historically have a hard time leading tribal movements, I stepped up to take a turn to lead. It was during a part of the song with no obvious beat and I was spastic. “With the beat,” Tammy said into the microphone, and I settled onto the most obvious beat as the song’s percussion returned, trying to keep it simple, relieved when the leader changed and someone else stepped up. Soon, we switched back into moving throughout the entire room. Just as the energy of the room was rising again, another mishap arose. This time, the table that the dancer had hit her head on, and that held Tammy’s computer and mixer, crashed to the ground, its legs crumpling on one side, dumping the equipment. Again, several people in close proximity moved to help and the situation was righted quickly. “What is happening? Are we cursed or something? Is there some prankster spirit messing with us?” I asked internally. “Does anyone feel like stopping?” Tammy asked the room. “Yes,” I nodded softly. But instead of stopping, Tammy gathered us in another collective exercise, and kept instructing us to partner. I wasn’t sure which rhythm we were in at a given time, but I moved in deep connection with Chaos when it came. Bounding, leaping, touching ground and soaring, “Softer, softer, softer,” I kept telling myself, letting any edges express, but not specifically intending to engage or explore them. Not having danced for two weeks because of the holidays, some of my ongoing experiments seemed to have evaporated, a gestural re-set button. I tried to find my recent big, pelvis-rocking, momentum-coiled back step but instead found new expressions, spinning in a matrix. When the first wave finally concluded, I had another rush of Chaos and followed its impulse, with energetic arms and released head, moving to the edge of the group as Tammy gathered the class for an interim talk between the first and second waves. She addressed the multiple mishaps, and said that she knew the dancer who was injured was in good hands. She also expressed that each episode had been subject to causes and effects, and that individual members of the community responded appropriately in every instance. She went on to evoke the founder of the 5Rhythms practice, Gabrielle Roth, who emphasized again and again the importance of both individuality and community, especially in the final years of her life. Just before Tammy’s Friday Night Waves class the following week, on January 5th, I was under a warm comforter with my son, Simon, watching the 1939 version of the Wizard of Oz, wincing occasionally at the 1939 representations of identity, yet singing along, even drowsing off at intervals. “Mommy, why do they have to sing a song for everything?” Simon complained. Instead of going to his after-school program, I had left work early and picked him up at school myself, so he wouldn’t have to walk the mile with his afterschool group in sub-zero windchill. We had dinner at a steamy café with dripping glass windows and wet floors in our Brooklyn neighborhood, then repaired to movie time. I couldn’t imagine how I would possibly have the energy to unfurl and move, but figured I could just go to class and lay down on the floor, perhaps moving a finger or an arm or an eyelid or something. I would probably keep my heavy coat on the whole time, too, I projected. Dressing, I pawed through my big bin of crumpled dance clothes, looking for something that would enliven my cold mood. I pulled out an orange tank top, and a tiered orange skirt with sequins on the horizontal seams, much like the kind of skirt worn by the faded figurines topping display wedding cakes at low end bakeries. I nearly changed into black leggings and a black tank instead, but talked myself out of it in favor of the orange outfit, though I packed the discreet black articles in my dance bag in case I wanted to change once I got to class. There were very few cars on the icy, grey-slushed roads in Manhattan, and I arrived at the Joffrey in the West Village within 20 minutes. On the way, I listened to an alarming interview with author Michael Wolff, who had published the book “Fire and Fury: Inside the Trump White House,” earlier that day, yet another presidential event that has caused anxiety and distress in recent months. Joining as usual with a small group to wait for the elevator, we hunched our shoulders and remarked about the weather, noting the shared experience. Stepping out at the fifth floor, one of the first people I encountered was my friend who had fallen and hurt the back of her head during the previous Friday class. “How is your head?” I asked. “It’s fine,” she answered, smiling. “I’m so glad,” I said, leaning forward and kissing her forehead. Stepping into the studio, I noted with slight irritation that there was another crew member greeting people on entry, and was relieved that a distraction arose and I didn’t have to worry about how to manage our interaction. Settling my bag, coat, hat, gloves and scarf by the already jacket-laden ballet bar in the corner, I began to move, still wearing three shirts, and was sucked immediately into a rhapsodic flowing track, the loud orange skirt twirling heavily around my ankles. Spinning low, I repeatedly brushed my fingertips onto the floor in an arc. Tammy left the teacher’s table and danced throughout the room. I felt her energetic self brush mine as we moved briefly in proximity, experiencing myself as a rotating matrix, undulating luxuriously into and across and out from the center line of my body, rising and falling in hoops, gracing the space above, touching the earth below, my shoulders open and generous. I peeled off one shirt and then another, leaving them by an open window that was pouring in cold air, and revealing my entire bright-orange outfit. I noted a ferocious pain in my right heel. Flowing low and effortlessly again, I intersected painfully with another dancer, whose toenails dug into the top of my foot as he moved his own foot in a low circle. My face contorted, and I rushed to one side of the room and massaged it, hoping my pleasant flow had not been chased away. Soon, the pain passed and I regained a similar momentum, moving through the room. I exhaled gratitude and lowed softly, the magic of being in a 5Rhythms room coiling around me and moving me, despite myself, once again. Tammy invited us to partner again and again, but challenged us to pair lightly, with the reminder that “it’s about being with everyone.” I stepped into several successive dances, many with people I hadn’t encountered before, moving in decisive lines between partnerships, embodying Staccato. Entering into Chaos, still in partnership, I stepped in to a man with glasses, and we moved in a low, carved Staccato Chaos, approaching and retreating, spinning, and presenting our inner knees, moving from the back of the pelvis, the heavy tailbone. “Give your partner your full attention,” said Tammy, and we met each other’s gazes, beaming. Meeting two friends of many years, I attempted a curved orbit, my head leading me, and hit a stopping point a few times before momentum flung me around it, in weightless, inspired circles. In Lyrical, I moved with the same two friends, never out of breath, finding surprising twists and leaping from released inner legs. Tammy put on the tender, uplifted track “Follow the Sun” by Xavier Rudd and I soared without effort throughout the space, joining briefly with anyone who was open to me. Finding another new partner and settling in, I mirrored him, rolling my shoulders enthusiastically, and opening my throat and palms to the sky, unbridled, as he grinned with his mouth open, the arches of his feet smiling, and lifted off, too. In Stillness, I traveled. I imagined that I walked up the stairs at my Aunt Mae’s house – the same site of the Christmas Eve party a short time before – turned left briefly, then right, then opened a door into a cold, disused hallway, and another door into a room that I have visited in dreams throughout my life. Inside the room, I passed through another door, and stood at the end of a diving board, gazing out at the cosmos, wondering if I had the courage to step off the board and into limitless space. A shadow-like male ancestor spirit who is familiar to me came to offer support, overlapping with me, encouraging me to move forward, though part of me wondered if I could actually die, could actually cease to be if I did. When I did take a step, my body seemed gigantic. Clouds swirled below eye level. A large flock of birds passed through my chest, calling out. I flickered back and forth between wondering about “my” experience and being subsumed by it. Tammy gathered us around a lovely class centerpiece that one of the members of the crew had created, next to the room’s quietest wall. It featured transparent fabric with coils of light underneath it as though underground, a little elf-scaled tree that seemed above ground, and crevices of dried flowers tucked into the rolling curves of this tiny representation of earth. She couldn’t but speak about the strident cold, even remarking that the space heater in her office had broken down alarmingly that afternoon. She shared the insight that the state of being frozen significantly slows down the ground, and that some seeds need to freeze in order to be able to sprout at a later time, hinting that this moment of weather intensity is part of a natural cycle, and perhaps that dormancy does not imply the death of movement. This was a welcome perspective, as news reports I had absorbed that day seemed more dire. For example, CNN reported that the cold is “causing frozen iguanas to fall from trees in Florida.” I also read a news story about thresher sharks getting trapped in the waters off of Cape Cod and washing up dead onto ice-crusted beaches. By the end of Tammy’s talk I was cold again and didn’t feel like moving more. I stepped out to use the bathroom, and when I came back the room was already transitioning from the first rhythm of Flowing into Staccato. I was disengaged, a little hesitant, and afraid that I might crash someone or that someone might crash me, noticing how different I feel when I am not grounded. In Stillness, I again passed through the door beyond the door beyond the door at my Aunt Mae’s house, merging with limitless space. Tammy invited us to set an intention. I closed my eyes and thought of my seven-year-old son, Simon, wishing that he would live long, be happy, and know his own goodness. Without contriving it, I also wished that every mother’s seven-year-old would thrive, just as I hoped for my own child – a new default I am noticing recently, as with the car accident scare at my parents’ house, that even in the throes of strong emotions, awareness can automatically consider the collective experience. In both of these classes, Chaos presented itself again and again, a beautiful marble to inspect every aspect of, not simply catharsis, but too, patient, deep and luminous, demonstrating perhaps that with the help of community we can endure and thrive even in this decidedly tumultuous era.